Recent studies have found a significant association between PTSD and low heart rate variability (HRV), a biomarker of autonomic dysregulation. 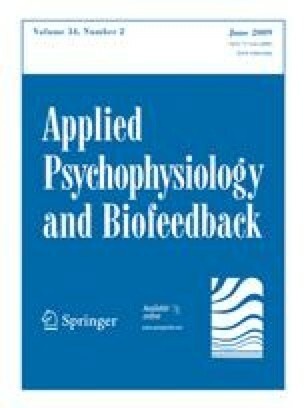 Research indicates that respiratory sinus arrhythmia (RSA) biofeedback increases HRV while reducing related pathological symptoms. This controlled pilot study compared RSA biofeedback to progressive muscle relaxation (PMR) as adjunctive interventions for 38 persons with PTSD symptoms in a residential treatment facility for a substance use disorder. Both groups were assessed at pre-intervention and 4-week post-intervention. Group × time interactions revealed significantly greater reductions in depressive symptoms and increases in HRV indices for the RSA group. Both groups significantly reduced PTSD and insomnia symptoms and a statistical trend was observed for reduced substance craving for the RSA group. Increases in HRV were significantly associated with PTSD symptom reduction. Overall, these results provide preliminary support for the efficacy of RSA biofeedback in improving physiological and psychological health for individuals with PTSD. This study was partially supported by a dissertation stipend from Helicor, Inc., the makers of the StressEraser portable biofeedback device used in the current study. Frederick Muench is the former Director of Clinical Research at Helicor. Richard Gevirtz is on the Scientific Advisory Board of Helicor. Investigators have no other financial conflicts of interest with the Sponsor.